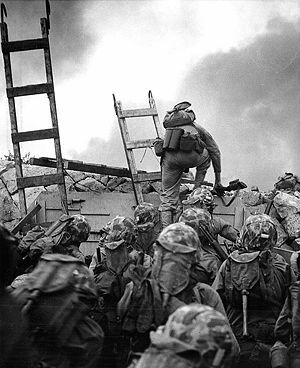 This article is an overview of the history of Korea, up to the division of Korea in the 1940s. See History of North Korea and History of South Korea for the post-World War II period. See also Names of Korea. 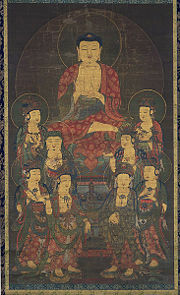 Amitabha and Eight Great Bodhisattvas, Goryeo scroll from the 1300s. The Korean peninsula has been inhabited since Lower Paleolithic times. According to legend, Korea's first kingdom, Gojoseon (then called Joseon), was founded in 2333 B.C.E. by Dangun, who is said to be descended from heaven. However, Korea's history has been one of constant struggle between forces of unification and division. The collapse of Gojoseon spawned the creation of the small kingdoms of the Proto-Three Kingdom period, which later coalesced into the mightier kingdoms of Goguryeo, Baekje, and Silla, inaugurating the Three Kingdoms Period around the time of Jesus. While Goguryeo and Baekje had great power for much of the era, Silla's power gradually extended across Korea, eventually establishing the first unified state to cover most of Korean peninsula by 668 C.E., beginning the Unified Silla period. Unified Silla lasted for 267 years until falling to Goryeo, under the leadership King Gyeongsun, in 935. Joseon, born out of the collapsed Goryeo in 1392, also ruled the entire peninsula, that rule lasting until Japan annexed Korea in 1910. The period of Japanese colonization lasted until 1945. Korea then divided into North and South occupation zones of the Soviet Union and United States established at the end of World War II. After the Korean War (1950-1953), the North remained under Communist rule and protection with the democratic South under the protection of the United States, with no hope of peaceful reunification at that time. The History of Korea stretches from Lower Paleolithic times to the present. The earliest known Korean pottery dates to around 8000 B.C.E., and the Neolithic period began before 6000 B.C.E., followed by that Bronze Age around 2500 B.C.E. The Gojoseon (Old Joseon) kingdom, founded in 2333 B.C.E., eventually stretched from the peninsula to much of Manchuria. By the third century B.C.E., it disintegrated into many successor states. The Korean kingdoms competed with each other both economically and militarily. While Goguryeo and Baekje had great power for much of the era, defeating Chinese invasions several times, Silla's power gradually extended across Korea, eventually establishing the first unified state to cover most of Korean peninsula by 668. Historians often call this period Unified Silla. Soon after the fall of Goguryeo, former Goguryeo general Dae Joyeong led a group of Koreans to eastern Manchuria, founding Balhae (698 C.E. - 926 C.E.) as the successor to Goguryeo. After Balhae fell in 926, the Crown Prince led most his people into absorption by Goryeo. Cheongja ùnhak sanggam mun maebyeong, the 68th national treasure of Korea. Unified Silla fell apart in the late ninth century, giving way to the tumultuous Later Three Kingdoms period (892-936), which ended with the establishment of the Goryeo Dynasty. During the Goryeo period, courts codified laws, the government introduced a civil service system, and Buddhism flourished. In 1238, the Mongolian Empire invaded, the two sides signed a peace treaty after nearly 30 years of war. In 1392, the general Yi Seong-gye established the Joseon Dynasty (1392-1910) after a coup. King Sejong (1418-1450) promulgated Hangul, the Korean alphabet, as an alternative to Chinese characters, previously the only system of writing. This period husbanded many cultural and technological advances. Between 1592-1598, Japan invaded Korea, but the Korean Navy, led by Admiral Yi Sunsin eventually repelled with support from Korean resistance armies and Chinese aid. In the 1620s and 1630s, Joseon suffered invasions by the Manchu Qing Dynasty. Beginning in the 1870s, Japan steadily forced Korea out of China's sphere of influence and into its own. In 1895, Empress Myeongseong was killed, with Japanese involvement in the assassination. In 1905, Japan forced Korea to sign the Eulsa Treaty making Korea a protectorate, and in 1910 annexed Korea, although international scholars consider neither legally valid. The massive nonviolent March 1st Movement of 1919 manifested Korean resistance to the Japanese occupation. Thereafter the Korean independence movement, coordinated by the Provisional Government of the Republic of Korea in exile, operated mainly in neighboring Manchuria, China and Siberia. With the defeat of Japan in 1945, the United Nations developed plans for a trusteeship administration by the Soviet Union and the United States, but the Soviet Union refused to cooperate. In 1948, the South held UN mandated democratic elections while the North suffered the imposition of a communist dictatorship, divided at the 38th parallel. The North, emboldened by the belief the USA would refuse to come to the South's aid, attack the South on June 25, 1950, unleashing the Korean war of 1950. Archaeological evidence shows that hominids first inhabited the Korean Peninsula 700,000 years ago, though some North Koreans claim it may have been inhabited for 1,000,000 years. Tool-making artifacts from the Paleolithic period (700,000 B.C.E. to 40,000 B.C.E.) have been found in present-day North Hamgyong, South P'yongan, Gyeonggi, and north and south Chungcheong Provinces. The people lived as cave dwellers and built homes, using fire for cooking food and warmth. They hunted, gathered and fished with stone tools. Korean earthenware jar with comb pattern. 4000 B.C.E., Amsa-Dong, near Seoul. British Museum. 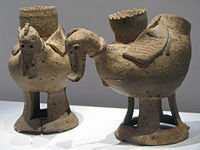 The earliest known Korean pottery dates back to around 8000 B.C.E. or before, and archaeologists have found evidence of Mesolithic Pit-Comb Ware culture or Yungimun Pottery throughout the peninsula. The Gosan-ni in Jeju-do provides example of a Yungimun-era site. 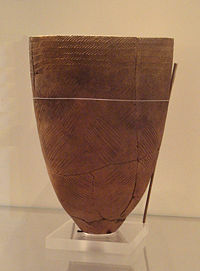 Jeulmun or Comb-pattern Pottery from after 7000 B.C.E. have been found, and concentrations of pottery with comb-patterns over the whole vessel have been found at sites in West-central Korea between 3500-2000 B.C.E., a time when a number of settlements such as Amsa-dong existed. Archaeological evidence demonstrates that agricultural societies and the earliest forms of social-political complexity emerged in the Mumun Pottery Period (c. 1500-300 B.C.E.). People in southern Korea adopted intensive dry-field and paddy-field agriculture with a multitude of crops in the Early Mumun Period (1500-850 B.C.E.). The first societies led by "big-men" or chiefs emerged in the Middle Mumun (850-550 B.C.E. ), and archaeologists trace the first ostentatious elite burials can to the Late Mumun (c. 550-300 B.C.E.). Bronze production began in the Middle Mumun and became increasingly important in Mumun ceremonial and political society after 700 B.C.E. During Mumun villages rose, became large, and then fell for the first time: some important examples include Songguk-ri, Daepyeong, and Igeum-dong. Trends denoting the end of the Mumun, including the increasing presence of long-distance trade, an increase in local conflicts, and the introduction of bronze and iron metallurgy appear around 300 B.C.E. According to legend, Korea's first kingdom, Dangun founded Gojoseon (then called Joseon), in 2333 B.C.E., in southern Manchuria and northern Korean peninsula. By 2000 B.C.E., painted designs evidence a new pottery culture in Manchuria and northern Korea. 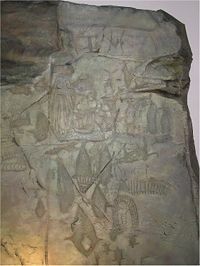 A replica of the Bangudae Petroglyphs at the Gyeongju National Museum. Although widely disputed in Korea, some later Chinese records indicate Gija, an uncle of the last King of Shang dynasty, migrated to Gojoseon around the twelfth century B.C.E. Korean scholars generally reject the claim due to contradictory written and archaeological evidence. The first historical documents to describe Gija, the Bamboo Annals (竹書紀年) and Confucian Analects (論語), make no mention of Gija's supposed migration to Gojoseon. The artifact most representative of Gojoseon, the bronze violin-shaped dagger, differs significantly in form and composition from its Chinese counterpart. Some Korean historians believe that Chinese historians embellished Gija as the progenitor of Gojoseon in the account of Han dynasty China's war with Gojoseon. Some scholars consider Gija Joseon a separate entity located at Liaoning, coexisting with Gojoseon. 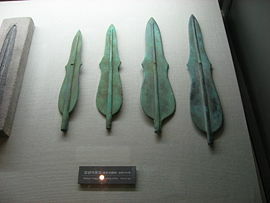 Liaoning-style bronze knives from Korea held at the War Memorial (Seoul). Most historians maintain that the Bronze Age began around 1500 – 1000 B.C.E. in Korea, though recent archaeological evidence suggests as far back as 2500 B.C.E. Bronze daggers, mirrors, and weaponry have been found, as well as evidence of walled-town polities. Rice, red beans, soybeans and millet were cultivated, and rectangular pit-houses and increasingly larger dolmen burial sites are found throughout the peninsula. Contemporaneous records suggest that Gojoseon transitioned from a feudal federation of walled cities into a centralized kingdom at least before the fourth century B.C.E. 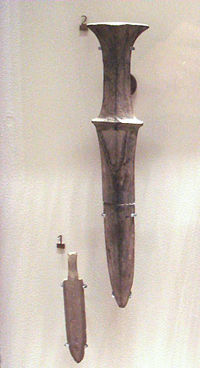 Korean stone dagger and stone arrowhead, seventh-sixth century B.C.E. Historians believe that by the third century B.C.E., iron culture developed and the warring states of China pushed refugees eastward and south. Recently an iron mirror has been found in Songseok-ri Kangdong-gun Pyongyang in North Korea, that may have originated from 1200 B.C.E. Around that time, a state called Jin arose in the southern part of the Korean peninsula. Historians know little about Jin except it established relations with Han China and exported artifacts to the Yayoi of Japan. A king of Gija Joseon may have fled to Jin after a coup by Wiman. Jin later evolved into the Samhan confederacies. Later the Han Dynasty defeated the Wiman Joseon and set up Four Commanderies of Han. Scholars dispute the course of the decline and fall of Gojoseon, depending on how historians view Gija Joseon. Joseon Sangosa suggests the theory that Gojoseon disintegrated by about 300 B.C.E. as it gradually lost the control of its former fiefs. Many smaller states sprang from the former territory of Gojoseon such as Buyeo, Okjeo, Dongye, Guda-guk, Galsa-guk, Gaema-guk, and Hangin-guk. Goguryeo and Baekje descended from Buyeo. The Three Kingdoms refer to Goguryeo, Baekje, and Silla, although Buyeo and the Gaya confederacy existed into 5th and 6th centuries respectively. The time before the rise of the Three Kingdoms of Korea has been sometimes called the Proto-Three Kingdoms period and sometimes called the Several States Period (열국시대). The era includes Goguryeo, Silla, and Baekje, and occurred after the fall of Gojoseon. This time period consisted of numerous states that sprang up from the former territories of Gojoseon. Among those states, Dongbuyeo and Bukbuyeo stood as the largest and most influential. After the fall of Gojoseon, Hae Mosu, a person of Gojoseon descent, gathered an army of Gojoseon people at Ungshin Mountain to establish a kingdom that would reassert the glories of Gojoseon. In 2333 B.C.E., Hae Mosu established Buyeo, and was given the title of "Dangun," which was the title given to the rulers of Gojoseon. Hae Mosu and his descendants ruled over Buyeo through seven generations. Hae Mosu and his descendants constantly fought with Wiman Joseon and its many neighbors. Buyeo slowly began to conquer those neighboring states, reunifying much of Gojoseon's former territories. Buyeo split in 86 B.C.E., after the death of its 4th Dangun, Hae Uru. With the death of Hae Uru, the throne of Buyeo went to Hae Buru, the brother of Hae Uru. Another contender challenged Hae Buru to the throne, Go Dumak, who descended from Goyeolga Dangun, the last ruler of Gojoseon. Hae Buru lost and fled to the east, where he reopened his kingdom, forming Dongbuyeo. After those events, Go Dumak combined the Dongmyeong kingdom with Buyeo, forming Jolbon Buyeo. Go Dumak continued on as the 5th ruler of Buyeo, and passed the throne to his son, Go Museo Dangun, upon his death in 60 B.C.E. Go Museo ruled over Jolbon Buyeo for two years before dying in 38 B.C.E. Go Museo Dangun had no sons, therefore, gave the throne to his son-in-law, who was Jumong, the founder of Goguryeo. Jolbon Buyeo later became the foundation for establishing Goguryeo, the northernmost and grew to become the most powerful of the Three Kingdoms of Korea. King Hae Buru, the brother of Buyeo's 4th Dangun founded Dongbuyeoin 86 B.C.E. Geumwa, mentioned in the Goguryeo Founding Myth, succeeded Hae Buru. Geumwa's son, Daeso, became the third and last king of Dongbuyeo. He fought against King Daemusin, dying in battle, thus bringing an end to Dongbuyeo. The Kingdom of Okjeo, a tribal state located in the northern Korean Peninsula, established after the fall of Gojoseon. Okjeo, a part of Gojoseon before its fall, never became a fully-developed kingdom due to the intervention of neighboring kingdoms. Okjeo became a tributary of Goguryeo, eventually annexed into Goguryeo by Gwanggaeto Taewang in the fifth century. Dongye, a small kingdom situated in the northern Korean Peninsula, bordered Okjeo. The two kingdoms faced the same fate of becoming tributaries of the growing empire of Goguryeo. Dongye existed as a former part of Gojoseon before its fall. After the fall of Gojoseon in 239 B.C.E., Choe Soong, a former Gojoseon official, established a "new Gojoseon" in Liaoning, calling it Nangnang-guk or "Nangnang nation." After a few years, the Nangnang Nation moved south into the Korean peninsula near the Taedong River, due to constant attacks by Wiman Joseon. Though scholars vigorously dispute its existence, certain passages in Samguk Sagi and several other ancient sources have provided proof. Nangnang Joseon coexisted with and paid tribute to Buyeo. Historical records mention only one ruler's name,Choe Ri, the last ruler is named. The last ruler of Nangnang Joseon, Choe Ri fathered Princess Nangnang, one of the main characters in a historical Korean love story. She and Prince Hodong of Goguryeo remained loyal lovers despite the war between Goguryeo and Nangnang Joseon. Goguryeo conquered Nangnang Joseon in 32 C.E. Samhan refers to the three confederacies of Mahan, Jinhan, and Byeonhan. The Samhan were located in the southern region of the Korean Peninsula. These three confederacies eventually become the foundations, at which Baekje, Silla, and Gaya were established. Mahan was the largest and consisted of 54 states. Byeonhan and Jinhan both consisted of 12 states, bringing a total of 78 states within the Samhan. The term "Samhan" is later used to describe the Three Kingdoms of Korea. 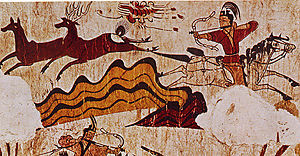 An example of a Goguryeo tomb mural. Jumong (posthumous name Dongmyeongseong) founded Goguryeo in 37 B.C.E. the earliest, first among the Three Kingdoms. King Taejo centralized Goguryeo. During King Sosurim reign Goguryeo became the first of the three kingdoms to adopt Buddhism as the state religion in 372. Goguryeo reached its zenith in the fifth century, when King Gwanggaeto and his son, King Jangsu expanded into almost all of Manchuria and part of inner Mongolia, and took the Seoul region from Baekje. Gwanggaeto and Jangsu subdued Baekje and Silla during their times, bringing about a loose unification of Korea. Goguryeo defeated a massive Chinese invasion in the Goguryeo-Sui War of 598-614, contributing to Sui's fall, and continued to repel the Tang dynasty. Yeon Gaesomun and Yang Manchun emerged as the central figures of the repulse. Numerous wars exhausted Goguryeo and it fell into a weak state after internal power struggles. An allied Silla-Tang force conquered Goguryeo in 668. 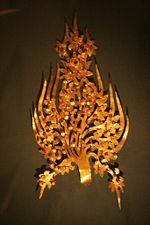 One of the two gold diadem ornaments worn by the Baekje King Muryeong of Baekje. Baekje's foundation by King Onjo in 18 B.C.E., as stated in the Samguk Sagi followed those of its neighbors and rivals, Goguryeo and Silla. The Sanguo Zhi mentions Baekje as a member of the Mahan confederacy in the Han River basin (near present-day Seoul). Expanding into the southwest (Chungcheong and Jeolla provinces) of the peninsula, Baekje became a significant political and military power. In the process, Baekje came into fierce confrontation with Goguryeo and the Chinese commanderies in the vicinity of its territorial ambitions. At its peak in the fourth century, it had absorbed all of the Mahan states and subjugated most of the western Korean peninsula (including the moder provinces of Kyonggi, Chungcheong, and Jeolla, as well as part of Hwanghae and Kangwon) to a centralized government. Baekje acquired Chinese culture and technology through contacts with the Southern Dynasties during the expansion of its territory. Baekje played a fundamental role in transmitting cultural developments, such as Chinese characters, Buddhism, iron-making, advanced pottery, and ceremonial burial into ancient Japan. When the Baekje court retreated to Japan after defeat, other aspects of culture transmitted to Japan. A coalition of Silla and Tang Dynasty forces defeated Baekje in 660. 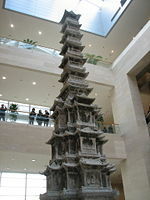 Down-sized replica of the famous 80 meter tall pagoda at Hwangnyongsa Temple destroyed by the Mongols. According to legend, the kingdom Silla began with the unification of six chiefdoms of the Jinhan confederacy by Bak Hyeokgeose in 57 B.C.E., in the southeastern area of Korea. Its territory included the present-day port city of Busan, and Silla later emerged as a sea power responsible for destroying Japanese pirates, especially during the Unified Silla period. 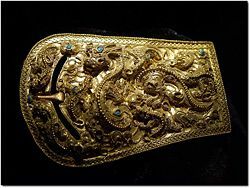 Silla artifacts, including unique gold metalwork, show influence from the northern nomadic steppes, with less Chinese influence than Goguryeo and Baekje showed. Silla expanded rapidly by occupying the Han River basin and uniting the city states. By the second century, Silla existed as a large state, occupying and influencing nearby city states. Silla began to gain power when it annexed in 562 the Gaya confederacy, between Baekje and Silla. Silla often faced pressure from Baekje and Japan, and at various times allied and warred with Baekje and Goguryeo. In 660, King Muyeol of Silla ordered his armies to attack Baekje. General Kim Yu-shin, aided by Tang forces, conquered Baekje. In 661, Goguryeo repelled a Silla and Tang allied attack. King Munmu, son of Muyeol and nephew of General Kim, ordered his uncle to launch another campaign in 667 and Goguryeo fell in the following year. Gaya, formed from a confederacy of chiefdoms in the Nakdong River valley of southern Korea, grew out of the Byeonhan confederacy of the Samhan period. Constituting one of the Three Kingdoms of Korea, Gaya developed ironware culture. In 562, Silla absorbed Gaya. Post-668 Silla kingdom is often referred to as Unified Silla, though the term North-South States, in reference to Balhae, is also used. Unified Silla lasted for 267 years until falling to Goryeo, under the leadership King Gyeongsun, in 935. Bulguksa Temple is a UNESCO World Heritage Site. After the unification wars, the Tang Dynasty established territories in the former Goguryeo, and began to administer and establish communities in Baekje. Silla attacked the Chinese in Baekje and northern Korea in 671. China invaded Silla in 674, suffering defeat at the hands of Silla General Kim Yu-shin. Defeating the Chinese army in the north, Silla drove the Tang forces out of the peninsula by 676 to achieve unification of most of the Three Kingdoms. Korean arts flourished dramatically and Buddhism became a large part of Silla culture during the Unified Silla period. Buddhist monasteries such as the Bulguksa provide examples of advanced Korean architecture and Buddhist influence. 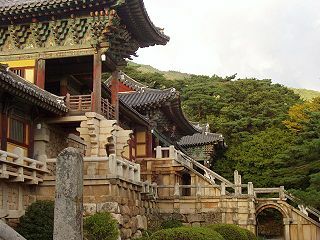 State-sponsored art and architecture from this period include Hwangnyongsa Temple, Bunhwangsa Temple, and Seokguram Grotto, a World Heritage Site. Silla began to experience political troubles in 780 when rebel leaders repeatedly assassinated kings. That severely weakened Silla and soon thereafter, descendants of the former Baekje established Later Baekje. In the north, rebels revived Goguryeo, beginning the Later Three Kingdoms period. 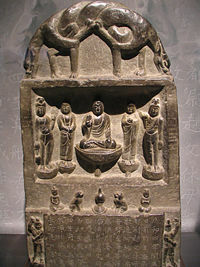 Balhae stele at the National Museum of Korea. Dae Joyeong, a former Goguryeo general, founded Balhae in the northern part of former lands of Goguryeo. Balhae controlled the northernmost areas of the Korean Peninsula, much of Manchuria (with the exception of the Liaodong peninsula for much of their history), and expanded into present-day Russian Maritime Province. Balhae styled itself as Goguryeo's successor state, adapting culture from the Tang Empire, for example in the layout of its capitals. In a time of relative peace and stability in the region, Balhae culture flourished, especially during the long reign of the third Emperor Mun (r. 737-793). Like Silla culture, Buddhism strongly influenced the culture of Balhae. However, Balhae, severely weakened by the tenth century, fell to the invading Khitan Liao Dynasty army in 926. No historical records from Balhae have survived, and the Liao left no histories of Balhae. Goryeo (see below) absorbed some Balhae territory and received Balhae refugees, including the crown prince and the royal family, but compiled no known histories of Balhae either. The Samguk Sagi ("History of the Three Kingdoms"), for instance, includes passages on Balhae, but no dynastic history of Balhae. The eighteenth century Joseon dynasty historian Yu Deukgong advocated the proper study of Balhae as part of Korean history, and coined the term "North and South States Period" to refer to this era. The Later Three Kingdoms (892 - 936) consisted of Silla, Hubaekje ("Later Baekje"), and Taebong (also known as Hugoguryeo, "Later Goguryeo"). Historians consider the latter two, established as Unified Silla declined in power, heirs to the earlier Three Kingdoms of Korea. Gung Ye, a Buddhist monk who founded Later Goguryeo originally led Taebong (Later Goguryeo). Wang Geon (877-943) deposed the unpopular Gung Ye in 918, when Gung Ye killed his wife and son. Wang Geon enjoyed popularity with his people, and he united the entire peninsula under one government. He attacked Later Baekje in 934 and received the surrender of Silla in the following year. In 936, Goryeo conquered Later Baekje. The famous Gyeongcheonsa Pagoda from the Goryeo Dynasty. Goryeo, founded in 918 and replaced Silla as the ruling dynasty of Korea by 936. ("Goryeo" is a short form of "Goguryeo" and the source of the English name "Korea.") The dynasty lasted until 1392. During this period the court codified laws, and the government introduced a civil service system. Buddhism flourished, and spread throughout the Korean peninsula. 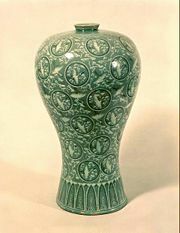 The development of celadon industry flourished in the twelft and thirteenth centuries. The publication of Tripitaka Koreana, and world's first metal printing technology in thirteenth century, attests to Goryeo's cultural achievements. In 1231 the Mongols began its campaigns against Korea and after 25 years of struggle and resistance, the royal family surrendered, signing a treaty with the Mongols. For the following 80 years Goryeo lived under the interference of the Mongols. In the 1340s, the Mongol Empire declined rapidly due to internal struggles. King Gongmin found the freedom to reform a Goryeo government. Gongmin had various problems that needed dealing with, including the removal of pro-Mongol aristocrats and military officials, the question of land holding, and quelling the growing animosity between the Buddhists and Confucian scholars. Meanwhile the "Japanese" pirates organized raids deep into the country. General Lee Seonggye distinguished himself by repelling the pirates in a series of successful engagements. The Goryeo dynasty lasted until 1392, when Lee Seonggye, also called Admiral Yi, who had heavy support among aristocracy, easily take power in a coup. 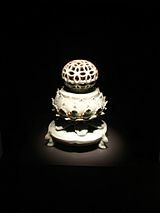 Kingfisher glazed Goryeo celadon incense burner, a national treasure of South Korea. 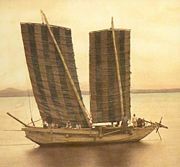 A fishing junk in 1871. The oldest extant photograph showing Koreans. In 1392 the throne sent Korean general, Lee Seonggye, to campaign against the Ming Dynasty in China, but instead he returned to overthrow the Goryeo king and establish a new dynasty. He named it the Joseon Dynasty in honor of the previous Joseon before (Gojoseon is the first Joseon. He added "Go" (meaning "old") to distinguish between the two). 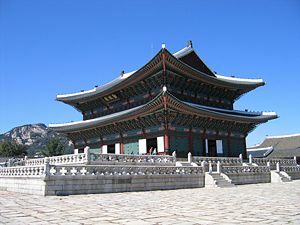 King Taejo moved the new capital to Hanseong (formerly Hanyang; modern-day Seoul) and built the Gyeongbokgung palace. In 1394 he adopted Neo-Confucianism as the country's official religion, resulting in much loss of power and wealth by the Buddhists. Joseon experienced advances in science and culture, most notably, the Hangul written alphabet, which King Sejong commissioned a team of scholars to create in 1443. The Joseon Dynasty has earned the distinction of having been the longest-lived ruling dynasty in East Asia during the last millennium. Joseon maintained a stable economy during peaceful times. The economy began to prosper once the Joseon court sat on a firm foundation, especially during King Sejong's rule. The economy suffered after the Japanese invasions 1592-1598 and internal court corruption, bribery, and heavy tax, strained the Korean economy. The Joseon formed a distinctly graded class system that impacted the economy. The king sat at the top of the system, yangban (government officials and generals) dirctly below him. Yangbans entered government as influential scholars during the Joseon Dynasty. The middle class consisted of merchants and craftsmen. The main economy rested on the lowest classes, the farmers and the lowest class, the slaves. At one point, slaves comprised 30 percent of the population. Korean Embassy to Japan, 1655, attributed to Kano Toun Yasunobu. British Museum. Joseon suffered a pair of [[Japan's Korea War: First Invasion (1592-1596)|Japanese invasions from Toyotomi Hideyoshi from 1592 to 1598]] (Imjin War). That conflict brought fame to Admiral Yi Sunsin, and the use of Turtle ships and Hwachas by the Korean military. Subsequently, Manchuria invaded Korea in 1627 (see the First Manchu invasion of Korea) and again in 1636 (see the Second Manchu invasion of Korea), after which the Joseon dynasty recognized the legitimacy of the Qing Empire. Korea traded with the Japanese at Busan, and emissaries went to Edo in Japan, while refusing to permit Europeans to trade at Korean ports until the 1880s. During the nineteenth century, Korea tried to control foreign influence by closing the borders to all nations but China. In 1853 the USS ''South America'', an American gunboat, visited Busan for ten days and had amiable contact with local Korean officials. Several shipwrecked Americans received hospitable treatment by Korea in 1855 and 1865, traveling to China for repatriation. The Joseon court noted with concern the foreign invasions and treaties involving Qing China, as well as the Opium Wars, and followed a cautious policy of slow exchange with the West. In 1866 the ''General Sherman'' incident put Korea and the United States into a confrontational relationship. In 1871, the United States conducted a limited punitive expedition in what the Koreans call the Sinmiyangyo. By 1876, a rapidly modernizing Japan forced Korea to open its ports and successfully challenged the Qing Empire in the Sino-Japanese War (1894-1895). In 1895, Empress Myeongseong was murdered. In 1897, King Gojong's court declared Joseon Daehan Jeguk (Korean Empire), and King Gojong became Emperor Gojong of Korea. Russia's influence in Korea followed, until Japan defeated Russia in the Russo-Japanese War (1904-1905). Korea effectively became a protectorate of Japan on 25 July 1907, the 1905 Protectorate Treaty having been promulgated without Emperor Gojong's required seal. 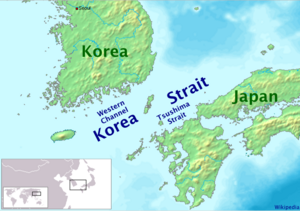 In 1910 Japan effectively annexed Korea by the Japan-Korea Annexation Treaty. Japan still asserts the legality of the treaty, while Korea has declared the treaty invalid since Emperor Gojong never applied the royal seal as required. Japan violated international convention by extorting Korea's compliance to the treaty. Japan controlled Korea under a so-called Governor-General of Korea until Japan's unconditional surrender to the Allied Forces, on August 15, 1945, with de jure sovereignty passing from Joseon Dynasty to the Provisional Government of the Republic of Korea. Korea constructed European-styled transport and communication networks across the nation. That facilitated Japanese exploitation, but modernization had little if any effect on the Korean people. Japan utilized the modernization of Korea to enhance colonial control, serving Japanese trade and consolidating control of Korea. The Japanese removed the Joseon hierarchy, destroyed Gyeongbokgung palace, and revamped Korea's taxation system to evict tenant farmers, exported Korean rice crops to Japan provoking Korean famines; and established a punitive series of measures which included murdering those who refused to pay taxes in the provinces; forced slavery in roadworks, mines, and the first sweat shop factories in Korea. Then Japan further promoted slavery of Koreans in Japan and its occupied territories by transporting forced slaves to those areas. After the Emperor Gojong died in January 1919, with a rumor of poisoning, independence rallies against Japanese invaders took place nationwide on March 1, 1919 (the March 1st (Samil) Movement). Japan suppressed the movement with brutal force, killing 7,000 peaceful demonstrators. An estimated 2 million people took part in peaceful, pro-liberation rallies. (The Japanese record claims less than half million.) Japanese crucified or burnt alive many Korean Christians, including an entire village of Jeamri, in churches as they demonstrated for Korean independence. United States president Woodrow Wilson's speech of 1919, declaring support for right of self determination and an end to colonial rule for Europeans partly inspired that movement. Wilson on Korean independence remained silent on the brutal slaughter of unarmed Koreans by Japanese soldiers and police, perhaps from the influence of a pro-Japan faction in the United States seeking trade inroads into China through the Korean peninsula. Korean independence fighters established the Provisional Government of the Republic of Korea in Shanghai, China, in an aftermath of March 1st Movement, which coordinated the liberation effort and resistance against Japanese control. Some of the achievements of the Provisional Government include the Battle of Chingshanli of 1920 and the ambush of Japanese Military Leadership in China in 1932. 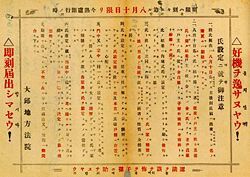 The Provisional Government constituted the de jure government of the Korean people between the period 1919 to 1948, with its legitimacy enshrined in the preamble to the constitution of the South Korea. Continued anti-Japanese uprisings, such as the nationwide uprising of students in November 1929, led to the strengthening of military rule in 1931. After the outbreaks of the Sino-Japanese War in 1937 and World War II Japan attempted to eradicated Korea as a nation by abolishing Korean culture. The Japanese government made worship at Japanese Shinto shrines compulsory. They radically modified school curriculum to eliminate teaching in the Korean language and history. The practice of Korean culture in any way became illegal. Korean culture and economy suffered heavy losses. Japan prohibited the use of the Korean language and forced Koreans to adopt Japanese names. Some Koreans left the Korean Peninsula for Manchuria and Primorsky Krai. Koreans in Manchuria formed resistance groups known as Dongnipgun (Independence Army) which would travel in and out of the Korean-Chinese boundary, fighting guerrilla warfare with the Japanese forces. Those guerrilla armies came together in 1940s as Korean Liberation Army and the Liberation Army took part in allied action in China and parts of South East Asia. Tens of thousands of Koreans also joined the Peoples Liberation Army and the National Revolutionary Army. At the Cairo Conference on 22 November 1943, Russia, Britain, and the USA agreed that "in due course Korea shall become free and independent”; at a later meeting in Yalta in February 1945, the allies agreed to establish a four-power trusteeship over Korea. On August 9 1945, Soviet tanks entered northern Korea from Siberia, meeting little to no resistance. Japan surrendered to the Allied Forces on 15 August 1945. The unconditional surrender of Japan, the earlier collapse of Nazi Germany, combined with fundamental shifts in global politics and ideology, led to the division of Korea into two occupation zones effectively starting on September 8, 1945, with the United States administering the southern half of the peninsula and the Soviet Union taking over the area north of the 38th parallel. In December 1945, a conference convened in Moscow to discuss the future of Korea. The participants discussed a 5-year trusteeship, and established a joint Soviet-American commission. The commission met intermittently in Seoul but deadlocked over the issue of establishing a national government. In September 1947, with no solution in sight, the United States submitted the Korean question to the UN General Assembly. The Soviet Union ignored a UN mandated call for democratic national elections; the USA went ahead with democratic elections in the South. That resulted in a communist dictatorship in North Korea and a democratic Republic of Korea in the south. On December 12 1948, by its resolution 195 in the Third General Assembly, the United Nations recognized Republic of Korea as the sole legal government of Korea. In June 1950 the Korean War broke out when North Korea massively invaded the south over the 38th parallel line, ending any hope of a peaceful reunification at that time. See History of North Korea and History of South Korea for the post-war period. ↑ Byeon (1999), 27. Byeon explains that the lower layers of Seokjangni and other sites have been dated to 600,000-500,000 B.C.E., and that the discovery of yet older layers at a site in Damyang County have led to the hypothesis that hominid habitation of Korea began around 700,000 B.C.E. ↑ Go-Choson Retrieved February 19, 2013. ↑ Jonathan Watts, The emperor's new roots The Guardian, December 28, 2001. Retrieved February 19, 2013. ↑ Chang-Gyun Han. 2002 한국의 선사시대에 대한 북한 고고학계의 동향과 시각-구석기시대와 신석기시대를 중심으로- "Trend and Perspective of Korean Prehistoric Study in North Korea." 한국고대사연구 (25) (March): 5-27. Retrieved December 3, 2006. ↑ Myth of Korea: Tangun Retrieved February 19, 2013. ↑ Old Choson and the Culture of the Mandolin-shaped Bronze Dagger dbpia.co.kr Retrieved February 19, 2013. ↑ 기자조선 Retrieved February 19, 2013. ↑ Neolithic and Bronze Age Korea Retrieved February 19, 2013. ↑ Gochang, Hwasun and Ganghwa Dolmen Sites Retrieved February 19, 2013. ↑ Park Seonhee, Editorial of Buksori www.dhamul.co.kr. (in Korean) Retrieved February 19, 2013. ↑ Jared Diamond, "Japanese Roots," Discover 19:6 (June 1998) Retrieved February 19, 2013. ↑ Thayer Watkins, "The Genetic Origins of the Japanese" Retrieved February 19, 2013. ↑ 13.0 13.1 13.2 The Ko Choson Korea's History. asianinfo.org. Retrieved February 19, 2013. 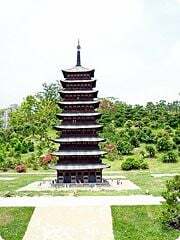 ↑ "Korean Buddhism Basis of Japanese Buddhism," Seoul Times, June 18, 2006. Retrieved February 19, 2013; "Buddhist Art of Korea & Japan," Asia Society Museum. Retrieved February 19, 2013; "Kanji," JapanGuide.com. Retrieved February 19, 2013. ↑ March 1st Movement Britannica.com. Retrieved February 19, 2013. ↑ 宮田 節子 [Miyata, Setsuko]. "創氏改名" [Creating Surnames and Changing Given Names], (明石書店 [Akashi-shorten], 1992, ISBN 4750304069). ↑ Japan court rules against 'comfort women' CNN Archives. Retrieved February 19, 2013. ↑ Washington Coalition for Comfort Women Issues Comfort-Women.org. Retrieved February 19, 2013. ↑ General Assembly Resolution 195 United Nations. Retrieved February 19, 2013. Diamond, Jared. Japanese Roots, Discover 19:6 (June 1998). Retrieved February 19, 2013. Watkins, Thayer. The Genetic Origins of the Japanese Retrieved February 19, 2013. History of "History of Korea"
This page was last modified on 10 January 2018, at 15:16.